They were easy, relatively quick, and really good. The kids loved them and John liked them quite a lot, too. 1. Find any biscuit recipe you like, and make it following the directions up until the “rolling out” part (I suppose you could do this with storebought biscuit dough, too). 2. Roll it out to either a 10-inch square or a nice rectangle. 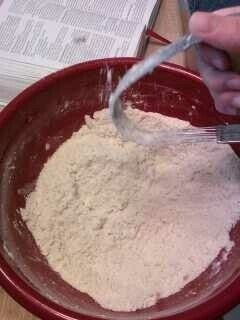 The dough should be about 1/4 inch thick. 3. Spread softened butter all over the dough and sprinkle brown sugar and cinnamon on top (the recipe called for just butter, brown sugar, walnuts, and raisins, but we modified it). 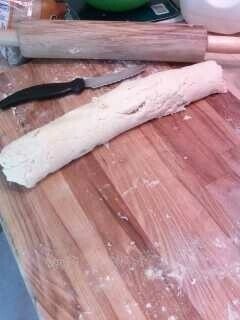 Roll the dough up as you do for cinnamon rolls. 4. 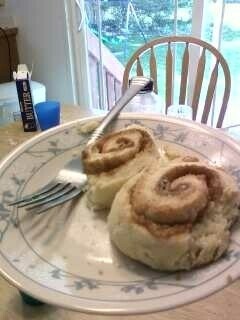 Cut with a sharp knife in pieces as for cinnamon rolls. My recipe I used made about 12 pieces. (I made my pieces about 1/2 inch thick or so). 5. Place on baking sheet, cut side down, and bake according to temperature and time called for in your biscuit recipe. (Mine used 450 F as a temperature and 10-12 minutes for baking. Also, I like to use parchment paper on my baking sheets so things won’t stick and the tray stays clean.) Enjoy! This worked really well for the GF (gluten-free) dough I used, also. It’s always great to find another recipe that my son likes! I used 1 cup of a GF mix and 1 cup of millet flour…plus xanthan gum, of course!… (I’ve recently discovered millet flour and it is GREAT for cooking with, and tastes so good). The dough was a bit too wet so I will cut back on the liquid next time. Bran loved it.